"I make it HAPPEN. YOU make it HOME." Since 1980, my most important asset as an outstanding Real Estate Agent has been YOU! I've devoted a great deal of time and attention to detail in becoming a Leader in my field.You will find that my professionalism, integrity, sensitivity, and excellent listening skills will guide you, meet your needs and guarantee your satisfaction! Since I represent YOU, I work alongside you to personalize your real estate needs. See for yourself! Remember your ACB's and Always Call Barbara to get started fulfilling your real estate dreams. © Copyright 2000 - 2012 Blue Reef Consulting, Inc. Questions about this site? 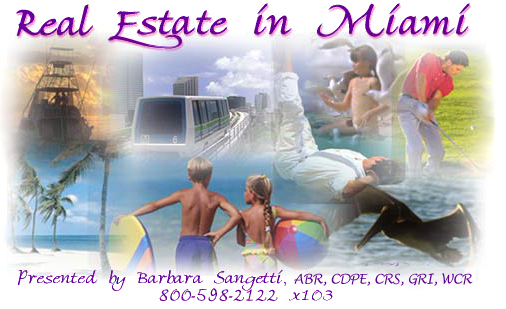 Write us at webmaster@realestateinmiami.com.